A sign ripped from the ground in the debris-covered car park at Doolin pier following the storm. Photograph by John Kelly. 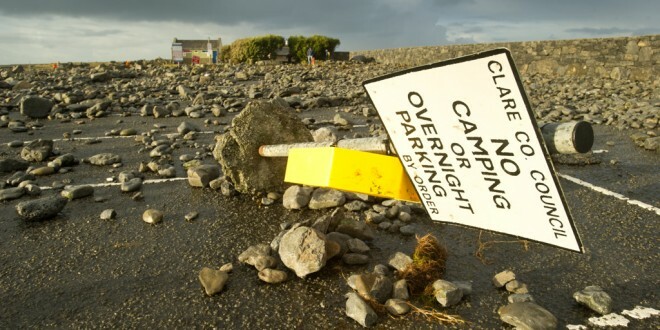 REPAIRS to public property along the Clare coast, caused by last weekend’s Storm Christine, is likely to cost millions of euro, according to Clare County Council’s senior engineer, Tom Tiernan. A preliminary estimate of the damage caused is expected to be announced at a specially convened council meeting on Friday. New Quay, Doolin, Lahinch, Liscannor, Seafield in Quilty, Doonbeg, parts of the Loop Head Peninsula, Carrigaholt, Kilbaha, Ross, Knock, Killimer, Kildysart and Ballynacally were the worst affected areas in the county. Many of the damaged coastal roads form part of the Wild Atlantic Way, a touring route stretching down the west coast, launched by Fáilte Ireland last year. “There has been a very serious roads component [to the damage] and not just a roads component but also a roads protection component. If you have a public road running along a coast, that infrastructure is very much exposed to the power of the sea and it requires some level of protection by way of a sea wall or something akin to that. Now sea walls, as well as roads, have been seriously compromised in a lot of those areas. Where they [sea walls] existed in some cases, the kind of protection was obviously better in some areas than in others,” Mr Tiernan said. Roads remain closed in parts of the county, while council officials expect the promenade in Lahinch to be open again by the weekend. At New Quay in the north of the county, “the priority is to get the road restored and get it to a point where it can facilitate what it always facilitated but the level of protection there has to be looked at in a serious way as well”. “At New Quay, at the prom in Lahinch and in a number of areas in the Loop Peninsula, there are alternative tertiary roads being used in places. Some roads that are not in great condition have to be used as an alternative means of getting around because some of the better known routes, the coastal routes, are not available or are not usable. There is a clean-up going on in places but in other places a clean-up will not be enough. There is substantially more work required and reconstruction is needed,” Mr Tiernan said. He said the council would be “making it our business to make sure that the prom is fit for purpose and to a reasonable standard for the coming season”. He acknowledged that the cost of repairing the damage caused by the storm will be “quite substantial” and is likely to run into millions of euro. Mr Tiernan said people in coastal areas had been very helpful in the clean-up efforts and any help offered in that area would be “welcome and appreciated”. Several public representatives have begun lobbying Government ministers in an effort to secure funding for the repair works around the county. Mr Tiernan believes the Government would put together a national application for European funding. “I can’t speak for what the Government will do. All we can take encouragement from is the fact that central government has been positive in terms of its suggestion that there will be some support but, obviously, there is very little in the way of specifics up to now,” Mr Tiernan stated. “What is in front of us is a large, probably protracted project and that will depend on us getting our hands on funding. It is very, very, difficult to say how wholesome we can be in our response because of the extent of the damage but all hands are on deck as far as Clare County Council is concerned. We are doing our best to stretch the resources we have at our disposal but the damage is so extensive that, at the moment, it is quite difficult,” he concluded. At the Clare County Council budget estimates meeting, which took place on Wednesday afternoon, county manager Tom Coughlan said the local authority has no special allocation to cover the emergency response to the storm. However, Mr Coughlan pledged the emergency repair work would have to be carried out regardless of whether the council has the money now and it would prepare a submission to recoup the cost from national funding.